stool 60 turns 80. | owl's house london. This stool is about as good as it gets. An iconic form – simple, practical, stackable, durable. I have two at home and I use them as bedside tables… and something to stand on if I need to reach beyond tip toes. A perfect little piece of design. The story started 80 years ago when Finnish architect and designer Alvar Aalto tested the sturdiness of his three-legged stool by repeatedly throwing the prototype to the floor at the Korhonen furniture factory. The simple wooden stool represented a new approach to furniture design, and a continuation of the brand of modernism initiated by Bauhaus. The use of wood instead of tubular steel was revolutionary at the time. Aalto had spent several years working on the stool’s design and the development of its curved, L-shaped legs. Stool 60 was first introduced to the international public at the Wood Only exhibition in London in 1933, to rave reviews. 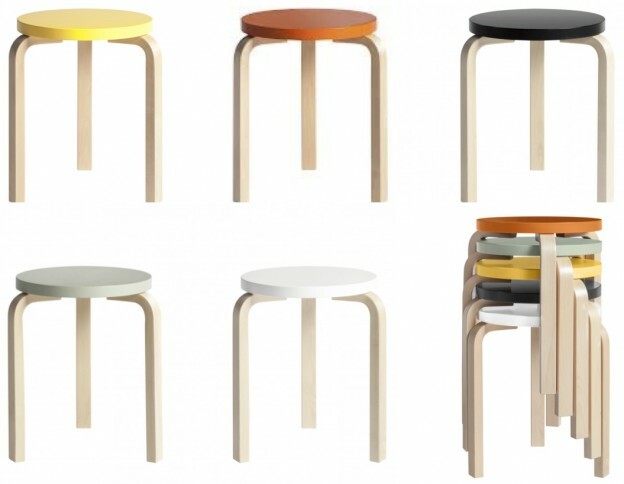 The colours of the Stool 60 Anniversary Edition are taken directly from Aalto’s Paimio Sanatorium (1928–1933): the yellow of the floors, the green of the walls, the turquoise of the handrails and walls, and the orange, white and black of the furniture. The Paimio Sanatorium is considered to be the most important functionalist building by Aalto. 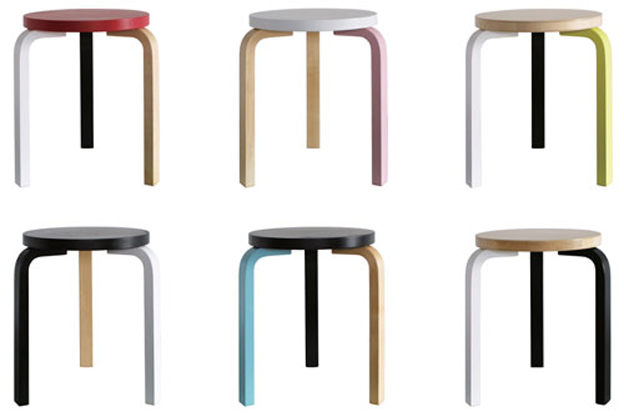 And German artist Mike Meiré’s Special Edition features four different colour ways – a red, black, white and birch stool, recalling the Bauhaus movement. A more industrial approach with sulphur yellow added to the black, white and birch. The third colour way is birch, white and light pink. The fourth is minty turquoise with birch and black. This entry was posted in found objects. and tagged Alvar Aalto, design, found objects, Mike Meiré, Paimio Sanatorium, stool 60 on January 18, 2013 by owls house london..
Aalto did his practical research thoroughly then ! I have my bedside tables organised . Which is probably a good thing . Pingback: a perfect pendant. | owl's house. Pingback: old, iconic and new – a stool and a light. | owl's house london.